The counter says it all – the day of our Gem Show opening is coming closer. In fact for those who are organising the show it is racing towards us. We are all working hard behind the scenes to make this show another success. This year we have made a few changes: you will find new dealers at the show, the fossicking area has been moved and we are selling real coffee – Barista made. There are even rumours of milk shakes and muffins. The theme is Quartz and this week anyone participating in the competition will have to hand in their entries: faceting, cabbing and jewellery. And while you are on the stage to check out the competition winners, have a look at the display of Quartz and the hand made jewellery. So if you have not yet booked the date, put it in your calendar as you don’t want to miss out on having a look around the show with all there is on offer. 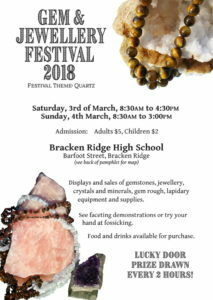 We are looking forward welcoming you at Bracken Ridge State High School for our annual gem show.